Things are going (and growing) well here. Although the weather was cool and wet most of this week, it was absolutely perfect today. Along with continuing the work of trellising up tomatoes, we worked on landscape related duties. In the late morning, I noticed that a tractor showed at the south field gate. 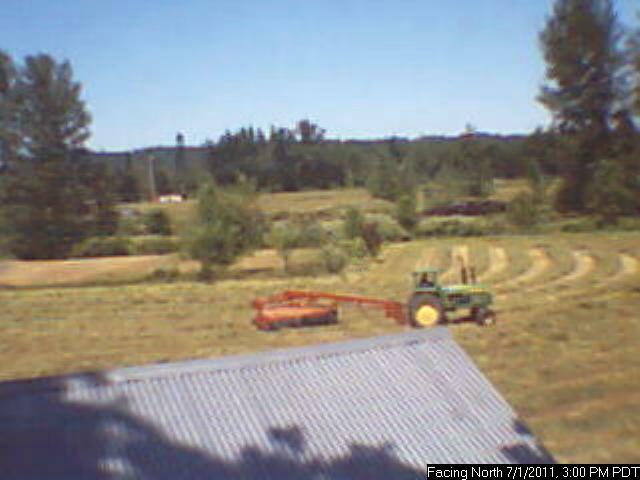 It was part of the haying crew preparing to start mowing. I immediately switched gears, got the brush mower, drank a bottle of water, ate a bite and hit the field. I needed to finish getting the line mowed between the hay and the trees so that the hay crew would not slip up and cut down trees. It took me a couple of hours but I got finished just before they started in mowing. Along with the areas of the farm dedicated to seed production, we also have many acres in grass hay. The biggest field was planted into tall fescue in 1961 and is still producing well. The bottom field, the one in the picture above, is one of our old pastures from back when cattle was raised here. It consists of many different grasses. The hay we raise is does several things for us. It is a low input crop requiring only an annual application of fertilizer. In our case, since we are a Certified Naturally Grown farm, we use chicken manure to feed the grass. Keeping the land in hay helps to keep it healthy, productive and the weeds at bay. As a bonus, the annual sale of the hay helps to pay the bills! It finally feels like spring has sprung here on the farm. I have been stuck in the office way too much the past few days but am planning on getting out on the tractor in the early in the afternoon. Catching up from last major entry, last week we did finish up planting all of the perimeter buffer trees that we are going to this spring. We still have 100 four year old bare root Austrian Pine trees that we need to deal with. After school, our youngest daughter has been working on getting them potted up and added to our tree nursery. We will then keep them watered and growing through the summer with the plan of planting them late this fall when the rainy season starts again. Every day is Arbor Day here. That forestry science class that I took in high school all those decades ago was worth it (thanks Mr. Hicks!). Part of routine maintenance here, although not particularly necessary for function, is keeping the perimeter fence lines mowed. Because we are Certified Naturally Grown and use no herbicides, and since the perimeter of the farm is roughly a mile, equipment is important to accomplish the task. Well, with the exception of the road frontage, the back parts of the farm have not been mowed since last fall. 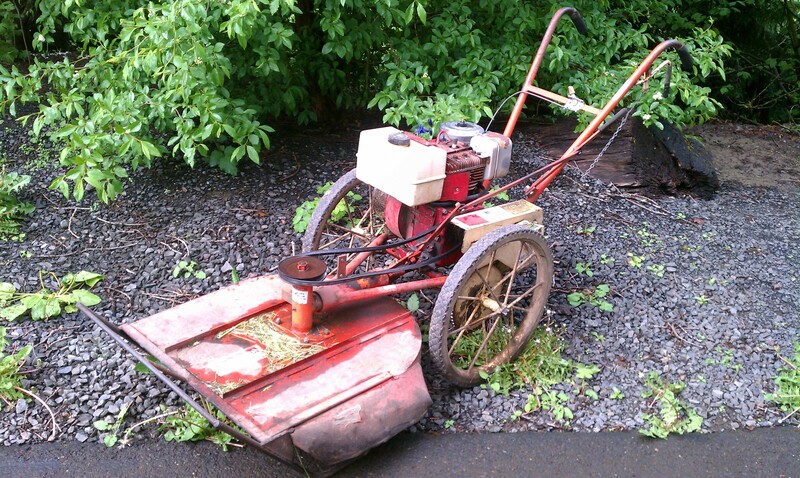 With the hay growing like crazy, the grass was way too high for the riding mower and I didn’t want to take the tiller off the tractor to put the mower deck on so I got out the old standby – the vintage 1994 DR Brush Mower. I checked the oil, did a quick visual inspection (the belt was trashed but I hoped it would hold out), fueled it up, and headed out. About 45 minutes later, I had made it to literally the point on the farm that is farthest from the farmyard. And bam! Not the belt. The engine. Good thing I am in pretty good shape because I had to push that heavy thing, with skinny tires, across a lot of soggy ground to get back home. 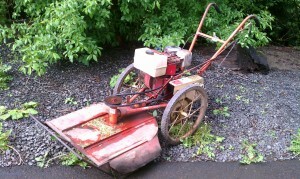 And as you probably guessed, a new mower is on the way and should be here in about another week. Order Backlog – The order volume has dropped off to a point where we have no backlog and are able to mail them out within one to two days. This is natural for us. Seed sales are very cyclical. Most folks get their gardens planned out and seeds ordered in the winter and early spring. After that, we have a lull until it is time to plan the fall / winter gardens. That is o.k. though. This lull comes at the same time we need to get out and start planning out our own grow outs and preparing so we have things to offer you next year. Don’t be modest – tell your friends and customers! Certified Naturally Grown farms and apiaries are committed to the highest ideals of sustainable agriculture. Congratulations on becoming one of our poster farmers! Thanks for all you do to help build a sustainable food system in your community. For those of you who are not familiar with Certified Naturally Grown (CNG), it is an alternative eco-labeling program that is built on the USDA Organic methods but structured in such a way as to be feasible to smaller, diverse growers. The standards we adhere to are no less strict, and as a matter of fact, by the very structure of CNG, more open, accessible and transparent to our customers. For more information about the CNG’s history, click here. Our farm’s CNG page can be found by clicking this link. What I Did On My Summer Vacation . . . Victory Seeds®, victoryseeds.com™, Vintage Veggies™ and vintageveggies.com™ are trademarks of the Victory Seed Company. Powered by WordPress ~ Theme Created by Jay Hafling.